I was cleaning up my studio the other day and I found a few photos. 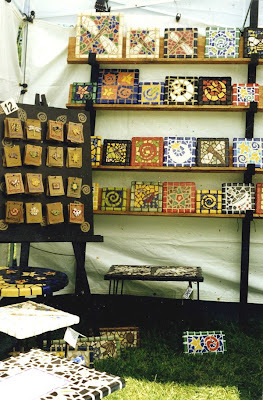 These are from the second art fair that I ever did. I was twenty three, just out of college. I had quit my job as a corporate floral designer and needed to come up with something to do. I have my BFA in ceramics and was making some tile tables for fun. People kept telling me I needed to sell them. 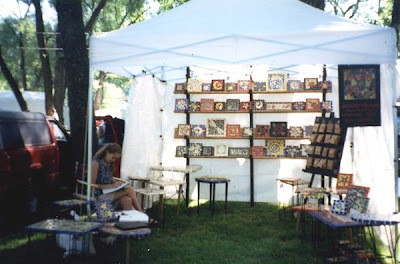 I signed up for a few art fairs that summer and thought I would try it out. My first show was in Chicago and I did alright. This picture is from my second show in Royal Oak Michigan. I sold out in the first hour. I had to sit there the rest of the weekend with nothing. On one hand I was very excited and on the other hand, I was kicking myself for not making more. That summer is what started my careeer as a self employed artist. I have been in business for 11 years. I started making beads six years ago, but that's a story for another day.